We’d love your help. Let us know what’s wrong with this preview of Love and Saint Augustine by Hannah Arendt. Hannah Arendt began her scholarly career with an exploration of Saint Augustine's concept of caritas, or neighborly love, written under the direction of Karl Jaspers and the influence of Martin Heidegger. 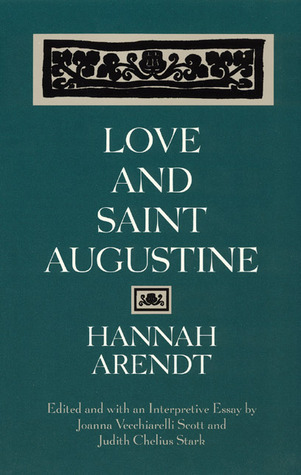 After her German academic life came to a halt in 1933, Arendt carried her dissertation into exile in France, and years later took the same battered and stained copy to Ne Hannah Arendt began her scholarly career with an exploration of Saint Augustine's concept of caritas, or neighborly love, written under the direction of Karl Jaspers and the influence of Martin Heidegger. After her German academic life came to a halt in 1933, Arendt carried her dissertation into exile in France, and years later took the same battered and stained copy to New York. During the late 1950s and early 1960s, as she was completing or reworking her most influential studies of political life, Arendt was simultaneously annotating and revising her dissertation on Augustine, amplifying its argument with terms and concepts she was using in her political works of the same period. The disseration became a bridge over which Arendt traveled back and forth between 1929 Heidelberg and 1960s New York, carrying with her Augustine's question about the possibility of social life in an age of rapid political and moral change. To ask other readers questions about Love and Saint Augustine, please sign up. The core of this book is a newly edited version of Hannah Arendt’s 1929 Ph.D. dissertation on Saint Augustine’s conception of love. As a student of Martin Heidegger and Karl Jaspers, she approached the topic from an existentialist point of view, that is by trying to grasp how Augustine understood love as a way of being in the world. Though surprising for a Jewish scholar to choose a Christian saint to study, the approach was not uncommon in German universities of the Weimar Republic. Her approac The core of this book is a newly edited version of Hannah Arendt’s 1929 Ph.D. dissertation on Saint Augustine’s conception of love. As a student of Martin Heidegger and Karl Jaspers, she approached the topic from an existentialist point of view, that is by trying to grasp how Augustine understood love as a way of being in the world. Though surprising for a Jewish scholar to choose a Christian saint to study, the approach was not uncommon in German universities of the Weimar Republic. Her approach was in no way partisan or sectarian; she simply attempted to put the insights of Augustine into terms of the human situation, accessible to anyone. This book came to my attention through my friend, one of the editors (who also wrote an interpretive essay), Judith Stark, who studied philosophy with Hannah Arendt at the New School for Social Research in the 1970’s. I currently know Judith through her work in Environmental Studies at Seton Hall University, where she collaborates with the South Mountain Conservancy, in which I am active. Judith also contributed to An Unconventional History of Western Philosophy: Conversations between Men and Women Philosophers, which I reviewed recently and found eye-opening. The contrast to which Arendt draws attention is between cupiditas and caritas, to use the Augustine’s Latin terms for a possessive kind of love and for a selfless kind of love. Augustine presented these as the way we are in the world first in the state of sin, and then after having been redeemed in the Christian scheme of things. Arendt considers these as how we are enmeshed in the world in the normal, default state of affairs, as compared to how we extricate ourselves from our enmeshment in order to attain a free and responsible way of being toward the world. Arendt poses the problem as a kind of conundrum. She interprets Augustine as saying that caritas involves loving our neighbor in the same way that God loves us, that is, with complete detachment and no thought of our own gain. And yet how can we form a community (Christian or otherwise enlightened) if we are emotionally detached from our neighbor? The answer is in what Augustine scholars call the Quaestio, in which he says “I have become a question to myself.” Augustine finds God in the place where he is a question to himself, that is, in the place where he asks, “Who am I? What am I going to do?” Augustine finds God in the same place where he finds himself. This leads to a selfless freedom in loving one’s neighbor, as well as to a kind of detached compassionate worldview which reminds me of Buddhism. This way of interpreting Augustine is somewhat new to me and makes me want to go back to reading Augustine’s Confessions, to see if I can find in Augustine what Arendt finds in him. Arendt’s interpretation of the Quaestio is fascinating to me because it resembles the theologian Paul Tillich’s conception of God as the “ground of our being.” If God is found where “I am a question to myself,” then God is where I shape my being from day to day. The resemblance is perhaps not surprising, because both Arendt and Tillich follow Heidegger. The book indicates that Arendt was interested in Tillich as a fellow émigré and fugitive from Nazi Germany, although it does not say if Arendt reacted to Tillich intellectually. I have pulled out only a thread of the book’s discussion, but I find it fascinating and enlightening to think, if Arendt’s interpretation is sound, that Augustine, a formative Father of the Church, thought of God not as an agent out there in the universe, but rather as the foundation of our consciousness (though he would not have used that word). This is rather a hip reading of Augustine and runs counter to conventional wisdom about what Christians believe. This book inspires me to go back to Augustine to assess for myself if Arendt has applied a modernist gloss or if she has identified a deep meaning. the English-American edition came out only in 1996.
mundane love which clings and is wrong. being with others in the world. the same time forceful but neither historical nor philological. to look at the existential origins of his thought. in the dissertation without, however, referring to this text. was created". This she finds as an expression of freedom. and full scope of Arendt's philosophical background. Understanding society (a recent concept) and the individual soul was a lifetime passion for Arnedt. This is a very good book, and it is interesting she starts out her major writing career with Augustine. This book is a gem! The best title I have ever read on this unequivocal subject -- it should be mandatory reading on any reading list. It is deep, penetrating, and brilliantly researched. Religious text pretty much. Love is love of god, self love. Love is how you approach the world. It was the right book for me at the right time in my life. Truly an enjoyable and accessible read. Wow! Hannah Arendt knows more about Christianity than most Christians I know. Ein beeindruckendes Buch. Es hat eine unglaubliche Dichte, die der Verständlichkeit aber nicht abträglich ist.